Anti-Russian language bill rally in Ukraine | Russian Legal Information Agency (RAPSI). 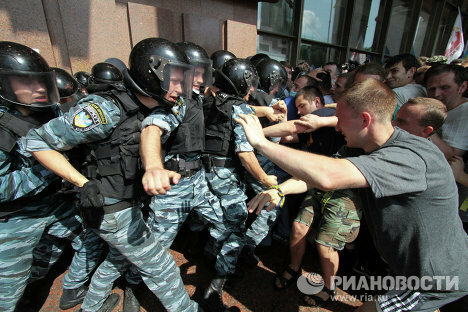 09:58 06/07/2012 Over 1,000 people led by opposition deputies protested the adoption of the law “On the Basics of Linguistic Policy” on July 4 in Kiev. The rally was held near the Ukrainian House, which hosted a news conference by President Viktor Yanukovych.